We got an email this morning that anatomy is cancelled and will be rescheduled for later this week hopefully. One of my classmates and I were in the car before we realized that our professor sent the email, so we just went back home until our class later this afternoon. Our anatomy review session is also cancelled for this week, which is a bummer because they are so helpful, but it’ll also be nice to have a full 3-day weekend! During our anatomy review session last week, we got to play with an Ultrasound machine. It was difficult to orient yourself and it took some time to understand what we were seeing on the screen, but it started to make more sense. We looked at the tendon of the long head of the biceps when it is close to the shoulder joint, we looked at the clavicle and the AC joint, and then we looked at the knee joint and the quads. It was really cool, and one of my classmates yelled “Anatomy is real!! !” and had everyone laughing. The volunteers also got printed photos of themselves, and one classmate commented “It’s a boy!”. We always have so much fun in class. 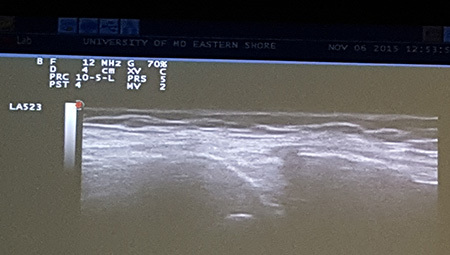 Ultrasound of the Knee joint. 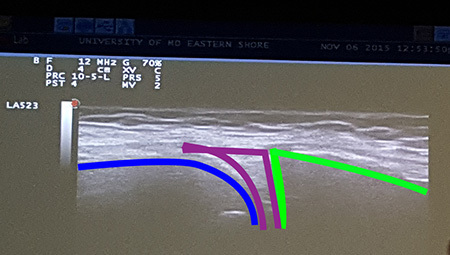 The femur is on the left in blue, the purple is the meniscus, and green is the tibia. 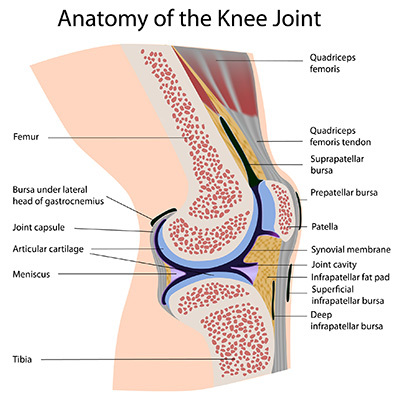 Here’s a labeled photo of the knee if you want a better idea of the anatomy. I’ve been better at keeping up with classes. It’s really easy to not study on the weekends, but I’m focusing on getting caught up with all my notes, rewatching the recorded anatomy lectures, and doing any assignments for classes that should be done before lecture that week. It’s a lot of work, and I only just realized that we have one exam this week, and three next week. I had no idea, but I shouldn’t be surprised. We tend to have at least one exam each week. It’s exhausting studying all the time, but I love what I’m learning. We do have time for fun though! Last weekend we had a halloween party and lots of the 1st years showed up in costumes. I dressed up as Ke$ha and spent the entire day shopping for fish net tights and doing arts and crafts (I painted a feather that I found in my front yard to wear in my hair, and tied an old theraband into a bow and wore it as a headband). Basically I didn’t do any work last weekend, and it was great! We’re also going out to dinner to celebrate our exam this week, and a lot of 2nd year students are seeing Hunger Games next week when it comes out. We have two exams earlier that day, so lots of first years are probably going that night too. School is time consuming and stressful, but I still have time to exercise (even though I don’t as much as I want to), I watch Netflix every day, I find time to call home, I go online window shopping and find lots of cute clothes that I shouldn’t be buying with my student loans, and I nap on the weekends (probably the best part of my week, let’s be honest – although I do still get my 6-7 hours of sleep each night). Overall, I can’t wait for Christmas break when I won’t be studying every single day. I miss my family and friends that live on the West Coast. Have you learned about real-time ultrasound before? Share your story below!